I'm late. I know, I'm a terrible reviewer, but end of the school year had me all bunched up. 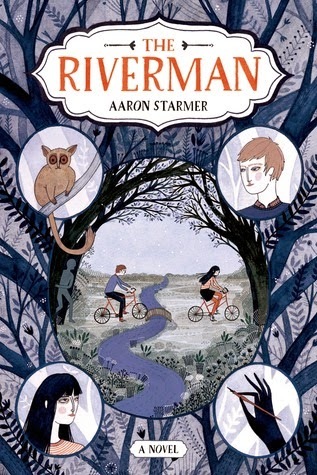 Anyway, here's my review for a terrific MG/young YA book called The Riverman by Aaron Starmer. Every culture, nation, people, town, city, village, school and even neighborhood has it's own myths, legends and folklore. I firmly believe that it comes from our base need, as a species, to tell stories to explain the things about the world around us that scare us. Starmer explores both of these ideas in this brilliantly written book that brings me back to my youth while keeping me grounded in who I am today. Childhood abduction/disappearance is a terrifying thing, both as an adult and as a child. As a child, from early on, we fear being taken from our parents. One of my earliest memories is being lost in the woods when I was a kid on vacation with my grandparents. It still kind of makes me chilly thinking about it. As an adult, the fear is amplified and much more intense as we think about our own children. Starmer tackles this difficult subject by wrapping it in a mythic story that uses just the right level of intensity, suspense and just plain weirdness as Alistair Cleary (interesting choice of name, BTW) is asked by his quirky neighbor Fiona Loomis to write her biography. The tale she weaves is mythic and Cleary tries to apply common sense to something that doesn't seem to require any sense at all. As Alistair spends time with Fiona, he is left with more questions than answers...but the one answer he gets is the one that changes him the most. He develops feelings for Fiona that are deftly handled in a great series of scenes that lampshade the tropes that this book could have very easily fallen into. For all the mythic elements of the story, in a lot of ways this is as much Alistair's story of growth as it is a record of Fiona's story of fantasy. Starmer blurs the line between reality and fantasy quite brilliantly. I'm still not sure if Fiona's whole story is real or just what she imagined. It's a testament to Starmer as a writer that I'm still not sure even a day after finishing the book AND reading several other reviews whether or not the Riverman is "real." Now, to be fair, Aaron Starmer and I grew up under very similar circumstances in the same area of upstate New York at about the same time, so I like him already. I've gotten to know him a little, well as much as you can via social media, and I like him even more, so it was easy to root for this book and that fact that it is so good makes me even happier. He peppers the book with references to the late 80s that a kid reading this book probably wouldn't get and Central New York that someone not from this area would completely miss. I completely enjoyed them. The Riverman is listed as a MG book, but I'd recommend it for anyone. It's a quick read that does a nice job of balancing mystery and suspense with the themes of the importance of stories to people. And that is what I can take from it as a writer.